Inspiration for new Gangs in San Miguel more often than not come one’s past and from memories of youth. Who can forget Sally Field as the Flying Nun? Come to think of it, not sure why she could fly nor how you could build a whole series around either a nun or someone who could fly and even worse both. 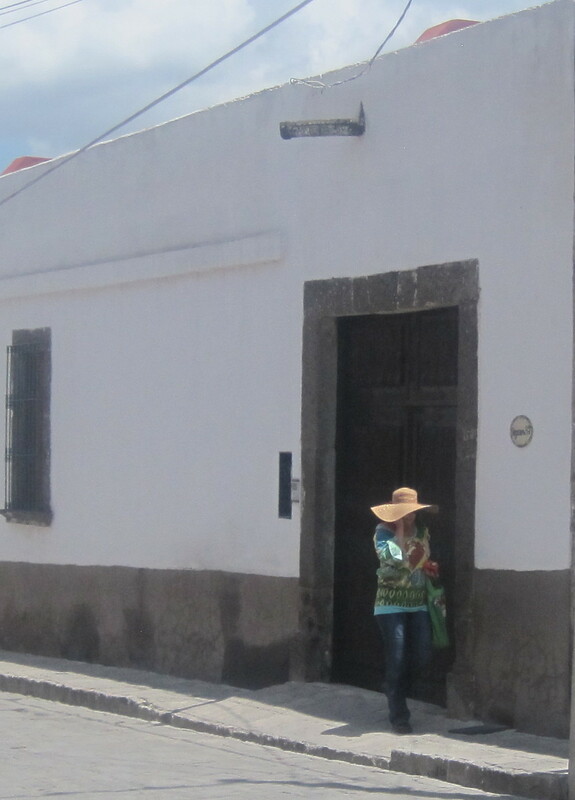 But on second thought, life in San Miguel have been built around even less. 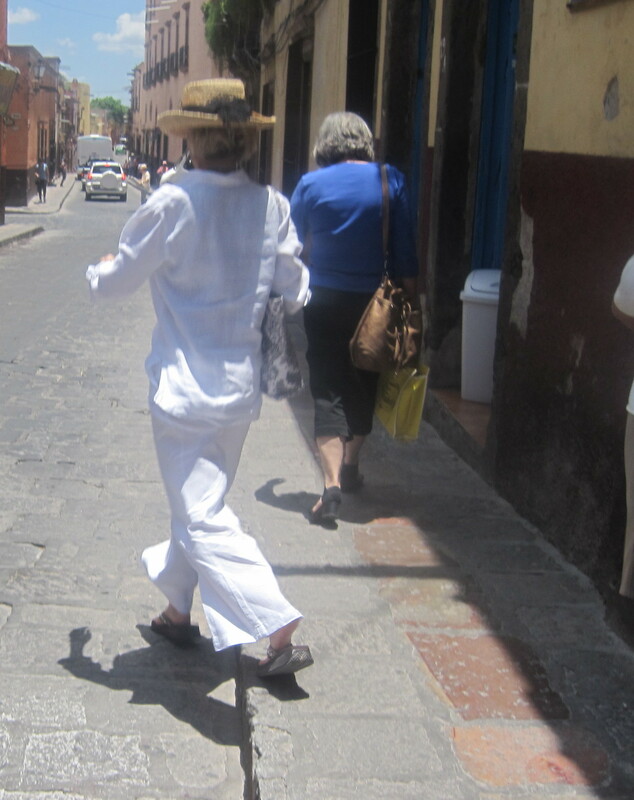 Here is the Flying Nun of San Miguel walking down the street. 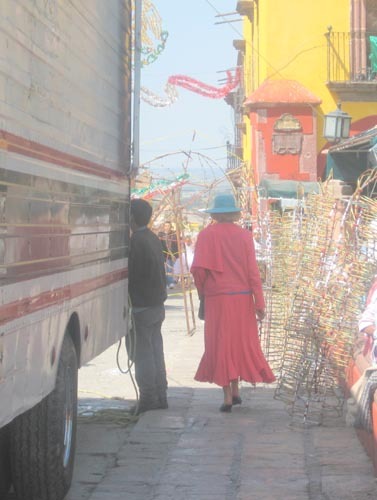 She has not quite mastered the flying part nor the nun part but she did find a hat in the Mercado. Every day, she hopes the Magic of San Miguel will work and she will be lifted off the ground. Today she is trying a new technique to achieve lift off. She is putting down her shopping bag because she thinks it is weighing her down. It is not going to work because she hasn’t quite come to terms with the fact that Sally Field was not really a nun nor could she fly. But dreams are what keeps San Miguel so magical. So every day, she will put on her Flying Nun hat and hope that today will be that day where she becomes famous. I can still hear my mother saying. You’re slouching. Put those shoulders back. You’re shuffling. Pick those feet up. You have no hat on. Go find a hat before you go out. You’re sauntering. Pick up your step. You’re not going out dressed like that. Change your clothes into something better. It’s a lovely day. Why are sitting around in here. Go outside and get some fresh air. Looks like this lady’s mother would be very proud of her. There is a purpose to a full length mirror, as Evelyn was about to discover. 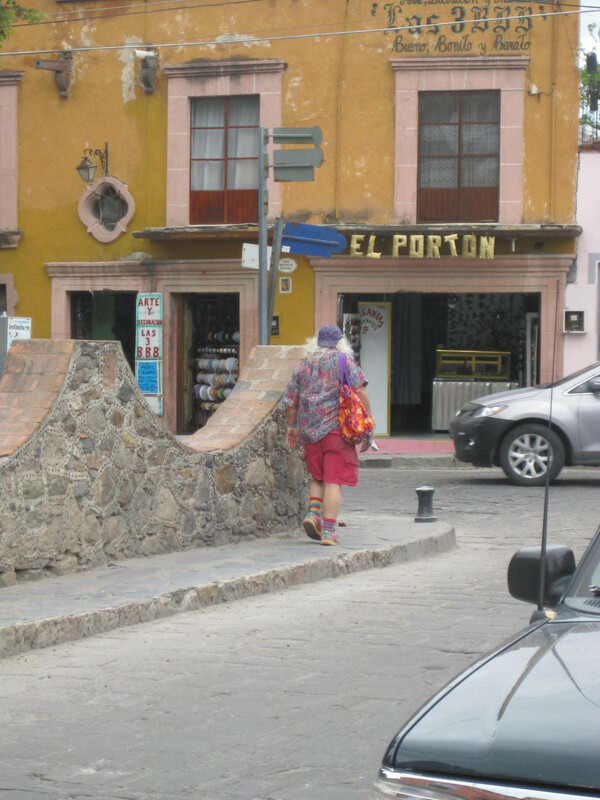 Evelyn began dying her hair red, years before coming to San Miguel, so she knew what that looked liked. 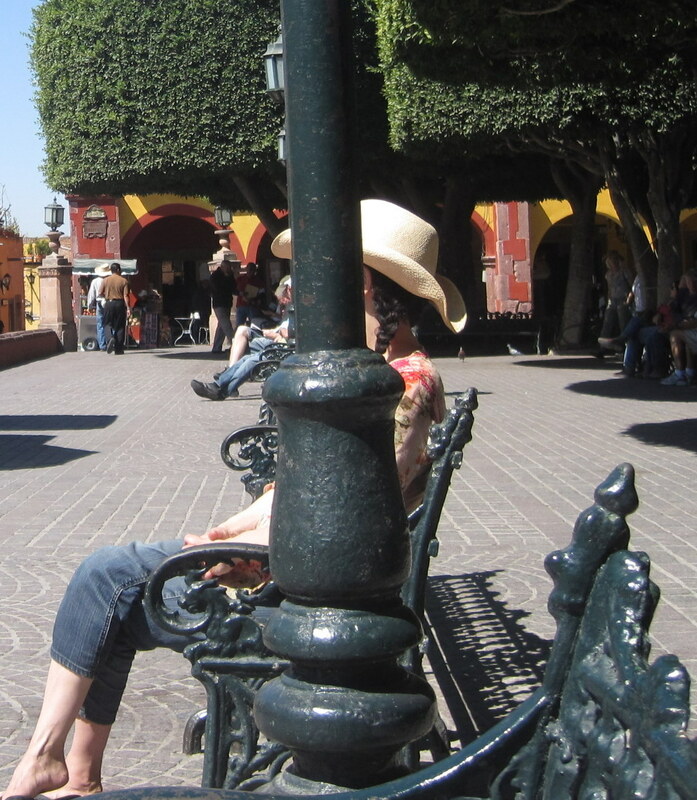 Well, the light is different in San Miguel and perhaps she doesn’t. 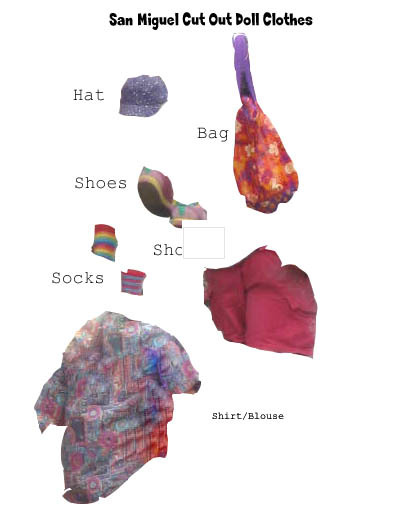 The rest of the Get Up as she calls it, was added bit by bit, after moving to San Miguel. A recent arrival and not understanding the timer function on the camera, Evelyn had never taken a pictures of San Miguel Evelyn wearing her new super heroine cape, post poodle skirt, and spotted shoes to send home. And in her small apartment, there was no full length mirror, just a small mirror over the sink, that only revealed to her, a small part of San Miguel Evelyn. Perhaps Evelyn is working out some unresolved issue with her mother, with this Get Up but it would be interesting to hear the tape playing in her head and hear those beginning bars of the Howdy Doody Show again. No, on second thought, to hear the tapes playing in the heads of San Miguel Gang Members, might be simply too much, for a sane person to bear. 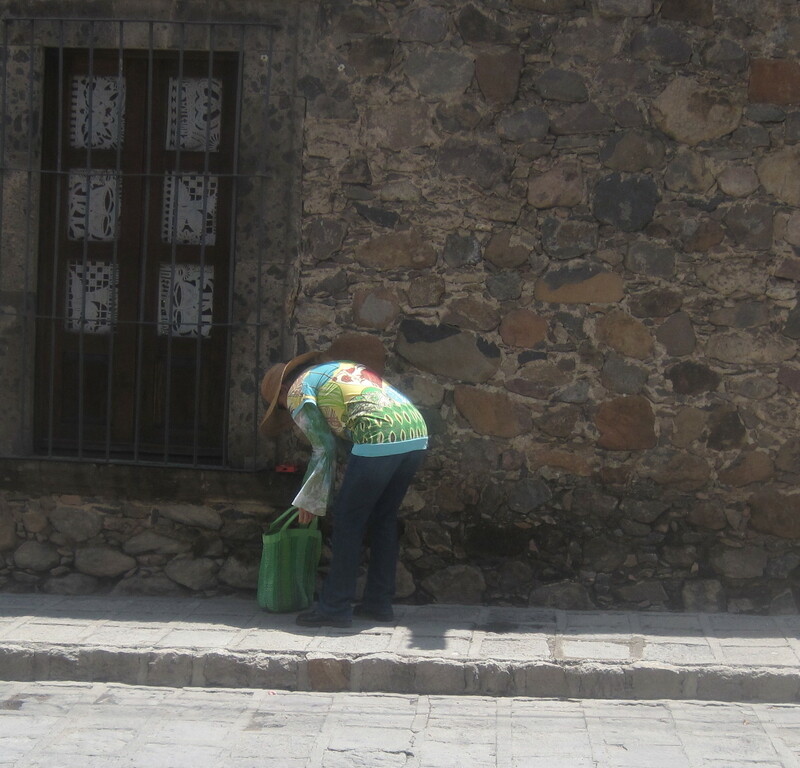 The Jardin in San Miguel is a gauntlet for most Mexicans, except those from DFA. They see things in San Miguel, that they thought existed only in Dungeons and Dragons or video games and are totally unprepared to deal with dark fantasy brought to life. This young man sees the Wall Wizard. . He looks and knows he must past by her to get to the other side of the Jardin. For a flash second, reality and his online life conflict and make him pause. Has she seen him? Will he need to fight her for safe passage? Will she control him and make her carry her bags? He worries. Most days he has safe passage unless they are sitting at a table with brochures or are restraining a small hairy beast on a leash. If he makes it past the Wall Wizard to safety, there will be more levels of Gringo Ghouls. Ahead is the cowgirls on the bench who may or may not have a lasso or six shooter. Life was never this hard before the Gringos came.